Abby Albaum spins a flaming hula hoop around her waist, then her knees. She shimmies it up to her shoulders and, in a flash, it’s spinning in her hand. It’s captivating: the fire’s rhythm, crackle and heat. But perhaps not as much as Albaum herself. She’s a natural performer, an effortless mover. For a crowd that hopes she never stops. A 37-year-old native Floridian, Albaum used to work in marketing and public relations — and, although she played Division III tennis in college, she didn’t grow up dancing. “It’s just one of those things that sort of found me later in life,” she says. One of the reasons it did? A friend named Kacey Douglas. So Douglas made her a hula hoop. For months, it stood in a corner, gathering dust. “I didn’t know what to do with it,” Albaum says. Finally, after seeing friends hoop dance at a concert, she decided it was time to pick it up. When she did, it took more than two hours to even get the hoop to spin around her waist — a move as basic and essential as dribbling in basketball. “I was not a natural,” she admits with a laugh. But after the first day, those arduous first hours, Albaum was hooked. “It became my form of stress relief, my movement meditation,” she explains. She practiced every day. She scoured YouTube for tutorials. It was 2009, and there were few. Instead, she examined videos of hoop dancers and deconstructed their moves herself. As her addiction swelled, she gathered friends to practice every Tuesday night. That group would later become her performance troupe, Hoola Monsters. Eight months later, she added fire. Since Albaum was handcrafting her own hoops, her dad suggested she get a booth at the St. Petersburg Saturday Market, which draws about 10,000 visitors each week. “It all started to snowball from there,” she says. People inquired about lessons, about performances. She got her hula hoop teaching certification for around $400 and started giving two classes a week. For the first year and a half, she juggled her growing business with a full-time job in restaurant marketing, where she made $70,000 a year plus benefits. Eventually she realized she couldn’t do both anymore and was faced with a difficult decision: Stick with a secure career she enjoyed — or risk it all to become a full-time hula hooper? She still had a degree, and figured she could return to marketing if she failed. Those first few years weren’t easy. Without savings from her previous job, she wouldn’t have survived. She babysat for friends. She bartered with other businesses. She did whatever it took to make ends meet. She even sold her house. “There are always ups and downs when you’re on that entrepreneurial roller coaster, especially in the beginning,” she explains. Nothing illustrates that better than the moment she almost gave up. A week after opening up for The Beach Boys and receiving a standing ovation, Hoola Monsters performed on the reality show “America’s Got Talent” — and was booed off stage. They’d never received a negative response before, and in the three months between the show’s taping and airing, she again reached a crossroads. “I could throw in the towel, or I could go bigger, better and harder,” she told me. You can guess which path she chose. Today, Hoola Monsters has seven active members and performs six times a month. Albaum charges $100-$300 per performer, depending on experience and type of show. Fire, for example, costs more. They’re typically hired for two hours, during which they might perform two or three 10-minute sets. If clients balk at the cost (“You’re only performing for 15 minutes!”), she reminds them of the preparation involved beforehand: booking events, negotiating contracts, practicing, costuming and other logistics. Although she pays her “girls” as independent contractors, they’re not in it for the money. “It literally changed my life — or saved it, if you will,” says Swanson, now a member of Hoola Monsters — and a huge fan of Albaum. Another troupe member, Salenna Nguyen, is an elementary school art teacher — which means, at many performances, she’s already been awake for 18 hours. But because of her dedication to Albaum, the long days don’t seem to bother her. Albaum reaches even more people through the six classes she teaches each week. For her adult class at a local recreation center, she pulled up in her Honda Element painted in pink and gray, emblazoned with her phone number and the “Hoola Monsters” logo. The back seats and trunk are roomy, but don’t have any room for passengers. “Yeah, it gets her out of driving anywhere,” ribbed her sister, who lives nearby and was attending the class. “I can fit 100 hoops in here!” says Albaum, laughing. She offered analogies that made learning easy: No T-rex arms, pretend you’re holding a cup of coffee you don’t want to spill. These kinds of comparisons come only from years of teaching — and, in Albaum’s case, developing your own certification program. Through her HoolaFit training, she’s certified between 50 and 60 other hula hoop instructors. 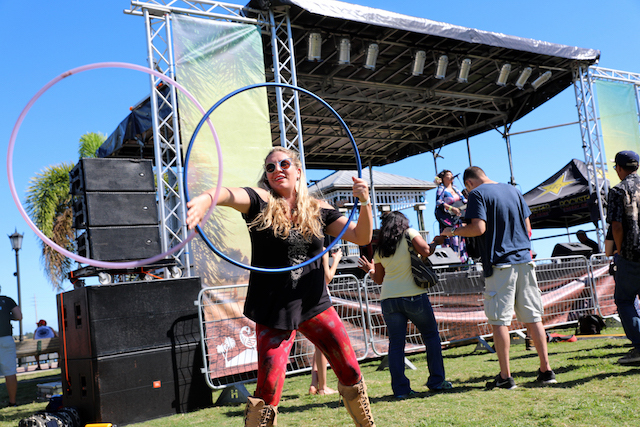 Most attendees were who you’d expect at a hula hoop class — millennial women in yoga pants. But one stood out: a balding, 30-something-year old man wearing glasses, cargo shorts, a black t-shirt, hiking boots. Albaum charges $10-$20 per class. The small classes have three to four students, while larger classes have up to 15. Although several of her classes are for adults only, it’s the kids classes she enjoys most. If you’d told her that when she started, she wouldn’t have believed you. Since she’d never worked with kids, she feared she wouldn’t connect with them. But parents kept asking her for kids classes, so she decided to offer a six-week session. She went on to create a children’s hooping company and DVD, and now teaches more kids classes than anything else. In addition, she performs at kids birthday parties, an option that’s proven quite lucrative. For a base price of $250 for a two-hour party, she helps the kids make their own hula hoops ($10 each) and also does a short performance. However, the majority of Albaum’s income doesn’t come from classes — it comes from product. Any time she “vends,” she’s a whirlwind of activity. At one music festival, wearing lace-up boots, tie-dye leggings, an off-the-shoulder top and John-Lennon sunglasses, she sprung from customer to customer. For hula hoopers of all types, her booth was ground zero. Although busy, she’s still her own boss — and made time to dance with a friend’s band. Already impressive with a single hoop, she soon added a second to the mix. For a song, maybe two, she was orbited by two rings of energy; a beatific planet, the eyes of onlookers pulled by her rhythm. Then, she put on her business hat and returned to her booth to do the thing that puts food on her table: selling hoops. In her 10 years as an entrepreneur, Albaum’s sold more than 10,000 hula hoops. They range in price from $20-$38, depending on size, material and style. On average, she spends $8 on materials per hoop, each of which take 5-30 minutes to complete. These handmade hoops aren’t the cheap plastic kind you might find at stores, or the weighted fitness hoops, which Albaum says can cause injury. They’re specially designed for hoop dance, and she sells them both at in-person events and through her Etsy store. She also sells handmade jewelry. Although her profits have decreased as the market’s become more competitive, product remains her biggest income source, followed by performances and classes. In total, she grosses $3,000 per month. As a full-time hula hooper. Ask Albaum if she ever regrets leaving her full-time job — and cutting her income by more than half — and she might laugh and shake her head. “I’m doing what I love, and you can’t put a number on that,” she explains. Albaum talks to customers at her booth during Rootfire in Cocoa, Fla. Heather Comparetto/The Penny Hoarder. She works 60 hours each week and never takes days completely off, but to her, the freedom is worth it. Whether watching Albaum perform, sell or teach, the best part is witnessing what happens when someone else picks up a hula hoop. But it’s also a powerful confidence-builder, a much-needed escape. She paints a mental picture: People going about their busy lives, slouching behind desks, scurrying from place-to-place — and then picking up a hoop. It’s true: As soon as someone tries to spin a hula hoop around their waist — enthusiastic or resistant, talented or clumsy — their face lights up with a smile. None are bigger than Albaum’s. Your Turn: Want to try hula hooping? If you’d like to check out Albaum’s Etsy store, you’ll get an exclusive 15% discount by using the code HOOPHOARDER.